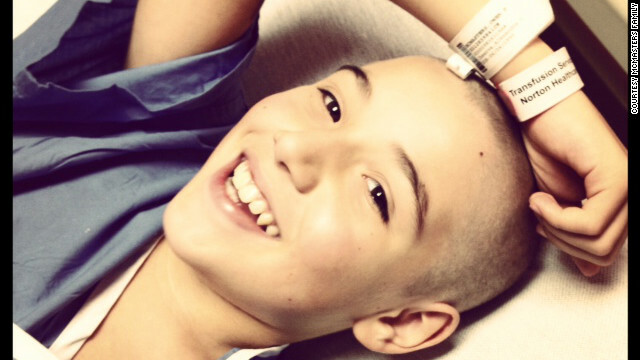 Editor's note: Owen McMasters, 12, was diagnosed with Acuta Lymphoblastic Leukemia in November 2011. His family has been dealing with the shortage of methotrexate, a drug that treats cancer by slowing the growth of cancer cells. Between 2006 and 2010, drug shortages increased by more than 200%. Read more about these shortages, and what the FDA is doing to help, on The Chart. Learning that the enlarged lymph nodes I showed my mom meant Acute Lymphoblastic Leukemia (ALL), a type of cancer, and not mono, was devastating. It meant my hair I loved fell out, leaving me with baby bird fuzz on my head. I underwent two operations in the first 36 hours and then went under anesthesia for either a spinal tap with chemotherapy, a bone marrow biopsy, or both, nearly every week. Because my platelets and white blood cell count are often critically low, I am unable to ride my bike, play any sports, wrestle with my brothers or do many of the things I like to do. My new friends are other kids with bald or fuzzy heads who are going through the same thing as me. Because I have every intention of beating cancer, and seem to be doing a great job of it so far (despite being told in November that my cancer was high-risk), I have done everything my doctors have asked of me. I take many different kinds of chemotherapy drugs, at least once per week and sometimes many days per week. I have to get my blood drawn frequently. I have to get up early, go to the doctor’s office or the hospital, and spend many hours getting treatment. I have been in the hospital sometimes for up to 10 days in a row. I had a severe infection from my immune system being wiped out. I have to get radiation treatments in my brain. Sometimes the treatments don’t bother me too much; sometimes they make me tired, weak, nauseated and unable to eat for days. They make me cramp all over and swell. While none of this is any fun, I do what I have to do and deal with it in my own way. I joke with the doctors. I entertain my parents. Sometimes I use bad words and get away with it because I have cancer. But I do everything I am told to do because I am going to live and be cured of cancer. The doctors say I have a very good chance to be cured if I take all of the treatments, which last for three and a half years. Two weeks ago my main doctor told me I was doing better than he ever expected. He was honestly shocked with my latest bone marrow biopsy. But in the next minute he told my mom I would likely not be able to undergo my next phase of chemo. The next phase is high dose methotrexate. I would receive this drug all the time - through an IV in my spine. It is the most frequent drug and the high dose is evidently going to be hard. I was ready for it because it is also what will keep my cancer from returning. It is what will make me live. My doctor told me drug companies had stopped making methotrexate in the form I needed and that the shortage was so bad no one would be able to get it in the next few weeks unless something drastic changed. He said the shortage had been going on to some degree for two years, but that it was critical now. I knew it was critical - it was going to affect me and all the other kids in the clinic that day and all the kids in the U.S. who also have ALL. I asked if we could get it from other countries and was told it isn’t that easy. He also said that the shortage of chemotherapy drugs for kids with cancer was a constant problem and was not just with methotrexate. Six months ago there was a shortage of AraC, another drug I take frequently. That very day the clinic nurses asked me if I had decided what I wanted for my wish from the Make A Wish Foundation. The people from Make a Wish had visited me the last time I was in the hospital, but I was so sick I only talked to them briefly. I talked to my parents and told them I would feel bad asking for something to be bought for me but might consider something all the kids could enjoy at clinic or on the children’s oncology unit at Kosair Children’s Hospital. After I got home from clinic, we researched the methotrexate shortage and found that my doctor wasn’t exaggerating. I decided my wish would be to fix the shortage of chemotherapy drugs so that other kids could get the treatments that they need to be cured of cancer. I wanted to make the shortage of methotrexate known by everyone who could do something about it. I wanted the drug companies to share my goal of curing my cancer and cancer in lots of other kids by making these drugs, even though they are cheap and might not make as much money as some others. The FDA has said that methotrexate will be available for now. But this problem is not solved for good. A permanent solution to this problem must be found. I don’t care how the problem is solved, it just needs to be solved. I like to think that I helped to make a difference by sharing my story. Thanks to Dr. Gupta and others who have expressed an interest in helping my wish to come true. See Owen and his family and learn more about the shortage of critical cancer drugs on "Sanjay Gupta, M.D." on Saturday and Sunday at 7:30 a.m. ET. Owen, you're story is amazing. I hope you don't mind that I quoted your article in a post my blog. My friend is running the Boston Marathon in April. In addition to finishing the race, her other goal is to raise money for the Leukemia and Lymphoma Society. I thought writing about both your story and hers would be a good way to raise awareness. You're an inspiring human being. Keep doing the best you can. Remember, everyone is rooting for you! Yesterday was my birthday. How may I help Owen? वन दन ज !बह त स ध व द आपक ज आपन इतन अच छ ल क स द य ह हम कर ब कर ब सभ ल क स पर गय कई प स ट स बह त पस आय पर इन द प स ट स क व श ष प रश स करन च ह ग "इन द र य न ग रहण - इर ष य एक घ तक म नस क व क र -Jealousy-A malignant caencr !" एवम " आ ख ,ज ब और क न पर पड त ल क ख लन क ....एक ग ज र श" स र थक और समज क सर क र स ज ड ल खन क ल य सभ ब ल गर स ध व द क प त र ह म र प स ट क यह श म ल करन क ल य बह त धन यव द ! I wish you all the best, I have seen you on CNN. You are wonderful boy and you have wonderful family. You can beat the cancer. I am myself breast cancer survivor and I know that battle with cancer is not always easy. But , you can do that, you are the WINNER. I wrote the post a couple of days ago and the aengda wasn't posted then. I'll update the post, but will you post announcements a bit earlier than 0-day in future, please?Readers can see from the link that several board members have stated on spi-general that they think there should be advice, but have any started getting it? That's not something ordinary members can do.I probably won't be at this meeting, due to attending after accepting an invitation sent to our local council. This is an encouraging story and you are a very brave boy and a winner too. You have fought a fight many have failed and bravely embraced your condition. Cancer patients all over the world are often faced with different challenges but am grateful that you have shown them how to fight a good fight despite any challenge that may come along. Thanks a lot for sharing this with all people you really recognise what you're speaking about! I'm impressed, I need to admit. Rarely do I encounter a site that's equally educative and interesting, and let me tell you, you've hit the nail on the top. Hello there, I think it really is a wonderful publish.